Beautiful! By the way, I totally thought your profile picture was your daughter! Oh, my gracious, that is a GREAT photo!!! I, too, thought your profile pic was Grace! You young looking thing, you! P.S. Thank you for the beautifully sweet comment you left on my FB for my birthday! Hugs! Beautiful! Have a Blessed Easter. How beautiful! What kind of coloring kit did you use? Beautiful. They look like glass eggs, but I expect they are from your chickens. I’d like to order a dozen for tomorrow! Very colorful, shiny and pretty. May you and your family have a happy, fun and blessed Easter. @GoneRetired – I didn’t use a kit. 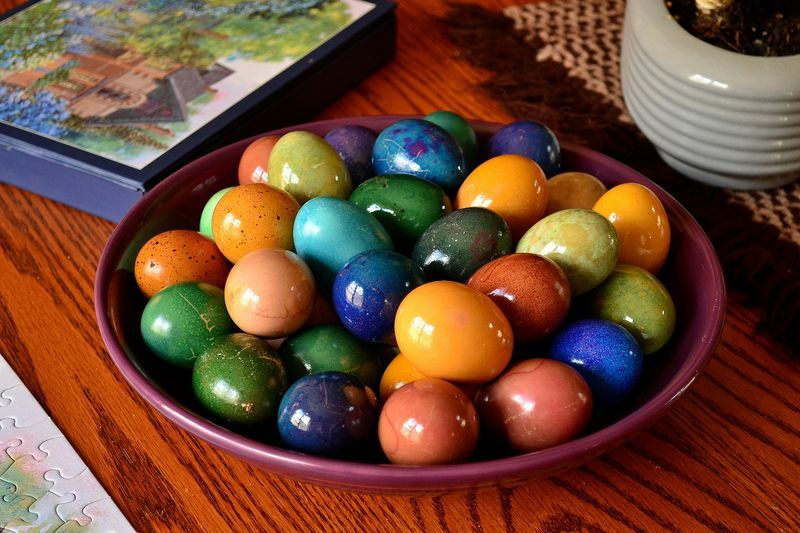 I had a variety of brown eggs here at home from my flock of chickens that I used to dye with food coloring and vinegar. I also used grated beets for the pink ones, & spinach for the greens. @cerwindoris – Yes, they were from our own chickens….and after I colored them I rubbed oil all over them!